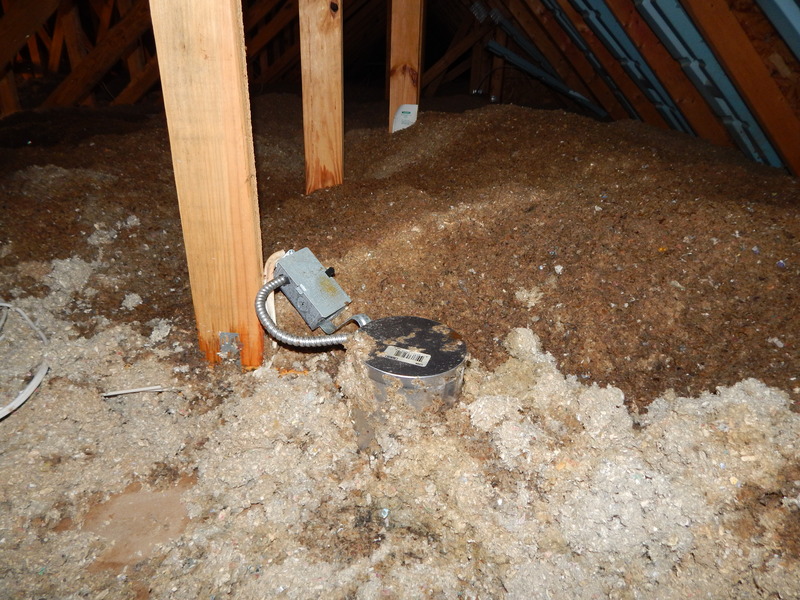 This pictures shows an attic with blown in insulation, (Cellulose), after a contractor entered the attic and accidentally stepped on a fire sprinkler. The line snapped nearly in half and hundreds of gallons of water and anti-freeze, flooded the attic and the rooms below. The water made it’s way down two floors and caused over $45,000 in total damage to the home and personal contents. How could this have been avoided? The contractor didn’t see the sprinkler line because it was buried under the insulation, but made the error of blindly walking up a darkened attic and thinking he was about to step on a piece of framing. Additionally, there is a tank nearest the attic hatch that he didn’t take under consideration upon entering that is a clear indication of a sprinkler line. But the home owners themselves were unaware that such plumbing existed in that section of the home. Knowing the layout of your entire home, and all of the systems within, could have been helpful and provided the contractor with a warning prior to entering the attic. For the contractor, checking the attic before moving about, and simply seeing that sprinklers were everywhere on the second floor of the property jetting out of the ceiling clearly indicated plumbing feeds must be in the attic. It’s an unfortunate accident for each party, and the lesson should always be, check before entering any section of the home, especially those to which are poorly lit and rarely ever used.